SuDS are more sustainable than conventional drainage systems because, rather than treating the water as a problem to be disposed of as quickly as possible, they are designed to manage flow rates, protect or enhance the water quality and to be sympathetic to the environmental setting and the needs of the local community by controlling rainwater at source (source control) or attenuating flows and regulating discharges to greenfield run-off. It is now widely accepted that the drainage of developed areas by conventional piped systems is not sustainable. These systems are designed to remove surface water run-off from developed areas as quickly as possible with little regard for the drainage regime downstream or the quality of the water. In dry periods when flows are low, these systems can often silt up, causing a problem when the next storm arrives. This contributes to flooding and pollution of watercourses. Also, by diverting rainfall to piped systems, the amount of water infiltrating the ground is reduced, depleting soils and ground water and reducing flows in watercourses in dry weather. In Wales the impact of flooding is well known, with approximately 12% of the housing stock (220,000 properties) are at risk from flooding. Recent flood events have only underlined the problem, and the predictions for future climate change and the need to meet the demand for housing means that the issues must be confronted. SuDS offer the opportunity to manage surface water, reducing the impact on flooding and pollution. 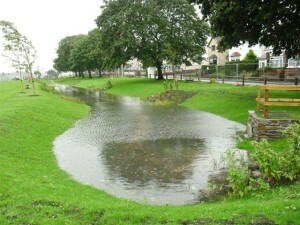 The National Surface Water Management and SuDS Group has been set up to provide a focus for SuDS implementation in Wales. The Group is made up of all the relevant stakeholders who are working together to actively promote the use of SuDS on developments in Wales. The Group has been instrumental in changing the focus in Wales so that today the SuDS approach is well accepted as the future for drainage solutions. This site is designed to help those who want to find out more about SuDS and for those who will need to implement sustainable drainage solutions across Wales.